What a beautiful symbolic portrait here. A bright, healthy, green, flourishing tree planted so close to it’s never ending life source that its roots are constantly being fed. The result is a tree which remains healthy, green and fruitful. Well I want to be a healthy spiritual fruit bearing tree. ​The Source of Our Soul’s Food … like a tree planted by streams of water…. ​Clearly, we are the tree mentioned in today’s scripture. And we are all planted and being fed, meaning we have roots extending out into something and returning food for our soul. The question in – what is our life source? What are we feeding on? Are we feeding on the fresh flowing life giving waters that a healthy relationship with God offers? Or the stale, stagnant, dirty waters of the world? It’s our choice, you see. The saying ‘garbage in – garbage out’ applies to our soul. ​Like a healthy diet for our bodies, we must control what we are letting feed our souls. Our soul food will determine the type and quality of fruit which our lives produce. If we want the nourishment that only God can give we must go directly to His flowing waters - the Word of God. 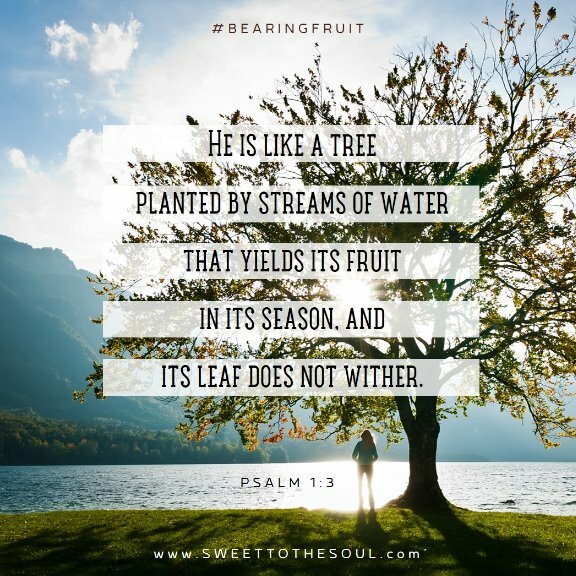 ​The Type of Fruit We Bear … that yields its fruit in season…. Galatians 5:19-26 Paul provides quite a list of both bad and good fruit. 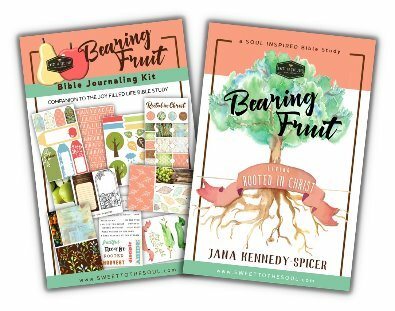 He details the spiritual fruit all of God’s children should bear, but individually we all have a unique kingdom purpose and a unique fruit to bear. Apple trees bear apples, not oranges or pears or peaches. And pecan trees bear pecans, not walnuts, peanuts or almonds. Each is a unique tree, each bears a unique fruit. We are each unique and God has set you apart for a specific kingdom job, you are designed to bear a specific kingdom fruit. ​The Health of Our Soul … its leaf does not wither …. Wither and fall off. We see some trees go through this cycle of losing their leaves every autumn. But for evergreens, this withering and falling off only happens when the tree is unhealthy or dying from lack of nourishment. · it becomes overtaken by pest or outside invader. This can happen in our own lives as well. Life circumstances can damage us spiritually and as a result we might disengage from relationship with God. ​It is vital to our spiritual health to remain rooted to our life source - especially in difficult times. As we remain faithful to God and we experience God remaining faithful to us, our roots grow deeper into Him and we become stronger. ​The Result of Our Faithfulness … in all that he does, he prospers…. To understand this last portion of today’s scripture, we must first understand what the Bible is meaning by “prosper”. We make an enormous error if we infer the world’s definition of prosperity – health and wealth – over the Biblical meaning in context of this scripture. The word “prosper” here is not a label for money, finances, acknowledgement or fame. “Prosper” here refers to being prosperous or successful as it relates to fulfilling our individual purpose. What is a tree’s purpose? 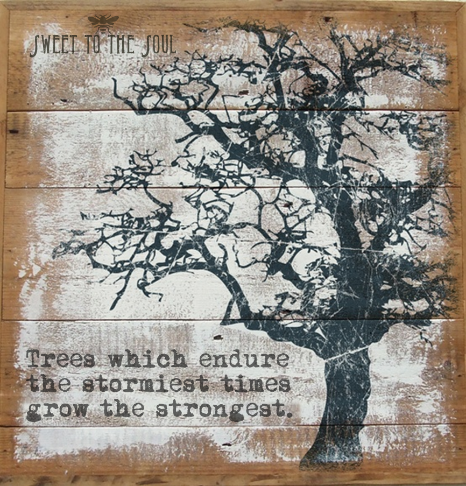 To bear fruit, whether literal fruit or by seeding other trees. If the tree stays rooted in its life source, it will prosper, it will be successful, it will achieve its purpose – it will bear fruit! Likewise, if we stay rooted in our spiritual life giving source, if we remain faithful in relationship with God, the natural result will be the achievement of our kingdom purpose – we will prosper! Are you going to share your #SoulFriends download of the Scripture references this month? I love to just take the opportunity to write them out each day in my journal. You are such a blessing to me and I know so many others! Many thanks! That's my question, too, Jana. Are you going to share your #SoulFriends download of the Scripture references for the month of March?? If you have free promos I would be interested in obtaining, enjoying, participating in them. Currently unable to purchase anything. Thank you.